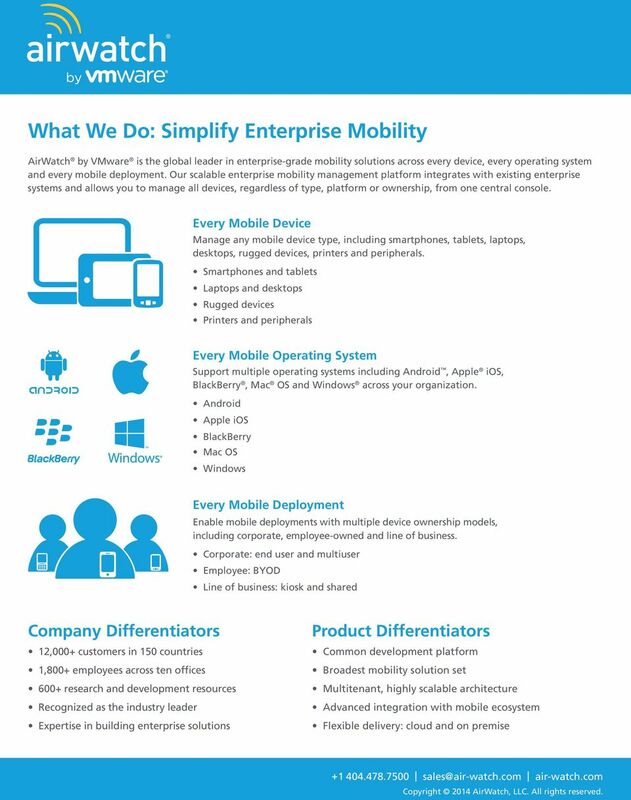 Download "What We Do: Simplify Enterprise Mobility"
1 What We Do: Simplify Enterprise Mobility AirWatch by VMware is the global leader in enterprise-grade mobility solutions across every device, every operating system and every mobile deployment. Our scalable enterprise mobility management platform integrates with existing enterprise systems and allows you to manage all devices, regardless of type, platform or ownership, from one central console. Every Mobile Device Manage any mobile device type, including smartphones, tablets, laptops, desktops, rugged devices, printers and peripherals. Smartphones and tablets Laptops and desktops Rugged devices Printers and peripherals Every Mobile Operating System Support multiple operating systems including Android, Apple ios, BlackBerry, Mac OS and Windows across your organization. Android Apple ios BlackBerry Mac OS Windows Every Mobile Deployment Enable mobile deployments with multiple device ownership models, including corporate, employee-owned and line of business. Corporate: end user and multiuser Employee: BYOD Line of business: kiosk and shared Company Differentiators 12,000+ customers in 150 countries 1,800+ employees across ten offices 600+ research and development resources Recognized as the industry leader Expertise in building enterprise solutions Product Differentiators Common development platform Broadest mobility solution set Multitenant, highly scalable architecture Advanced integration with mobile ecosystem Flexible delivery: cloud and on premise Copyright 2014 AirWatch, LLC. All rights reserved. 2 How We Do It: Enterprise Mobility Management Platform Workspace AirWatch Workspace provides complete separation of corporate and personal data on a device, ensuring corporate resources are secure and employee privacy is maintained. A secure containerized solution for all enterprise data including , applications, content and browsing, AirWatch Workspace is managed at the application level without MDM, making it ideal for BYOD and high regulation deployments. Devices AirWatch allows you to gain visibility into the devices including smartphones, tablets and laptops connecting to your enterprise network, content and resources. Quickly enroll devices in your enterprise environment, update device settings over-the-air and enforce security policies and compliance across your entire device fleet. Apps AirWatch enables you to manage internal, public and purchased apps across devices enrolled in your organization. Distribute, update, track and recommend apps with the AirWatch App Catalog. Build custom business apps with the AirWatch Software Development Kit, or wrap existing internal applications for advanced security with AirWatch App Wrapping. 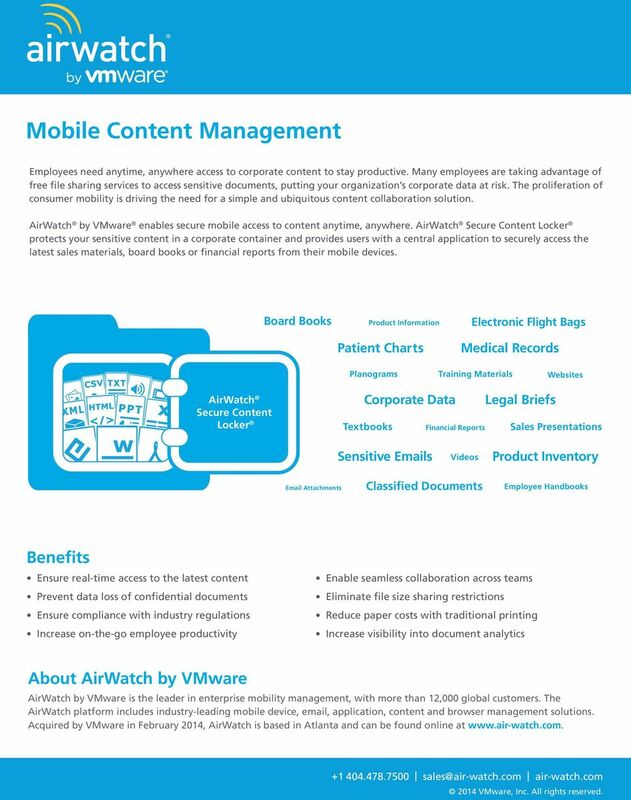 Content AirWatch secures document distribution and promotes content collaboration anytime, anywhere with AirWatch Secure Content Locker. Access your corporate documents, attachments and user-generated content in a secure container. Protect sensitive files with user authentication, file encryption, geofencing, sharing limitations and offline viewing restrictions. AirWatch integrates with your existing infrastructure to deliver comprehensive security for mobile . Control device access to corporate and encrypt sensitive data with AirWatch Secure Gateway. Containerize and provide a consistent user experience with AirWatch Inbox for Android and Apple ios. Browsing AirWatch Browser is a secure browsing alternative to native browsers and provides organizations with the ability to configure customized settings to meet unique business and end-user needs. Define and enforce secure browsing policies for intranet sites without a device-level VPN. Enable secure browsing with whitelists and blacklists or kiosk mode. Our Customers Fortune 500 Companies 9 of the Top 10 U.S. Retailers 6 of the Top 10 World s Biggest Airlines 2 of the Top 3 Worldwide Hotel Groups World s Largest Energy Firms 6 of the Top 10 Big Pharma CPG Companies Medical Device Companies Copyright 2014 AirWatch, LLC. All rights reserved. 4 The Leading Secure Content Collaboration Solution Anytime, Anywhere Access Across Mobile, Desktop and Web Protect sensitive content in a corporate container and provide employees with a central point to securely access their content across their mobile devices, desktop or web browser. Access AirWatch Secure Content Locker mobile application from Apple, Android and Windows devices. AirWatch Secure Content Locker Sync desktop client enables users with two-way synchronization of content from desktops to devices. The web-based self-service portal allows users to add, manage and share personal content. Enterprise-grade Security Policies and Data Loss Prevention Authenticate users using AD/LDAP, Kerberos, token and certificate-based methods. Content is encrypted in-transit, in use and at-rest with AES 256-bit, FIPS compliant encryption. Configure restrictions for advanced data loss prevention, including offline viewing, cut/copy/paste, printing and ing; along with open in restrictions. Enable users to capture photos and videos from their device camera directly within AirWatch Secure Content Locker and securely upload to a repository or personal content folder. Flexible Content Storage in the Cloud or Existing Repositories Meet the unique requirements of your enterprise with flexible content storage options for cloud, on premise and hybrid deployments. Content can be hosted in a public cloud, the AirWatch Cloud, an existing content repository or enterprise file share. 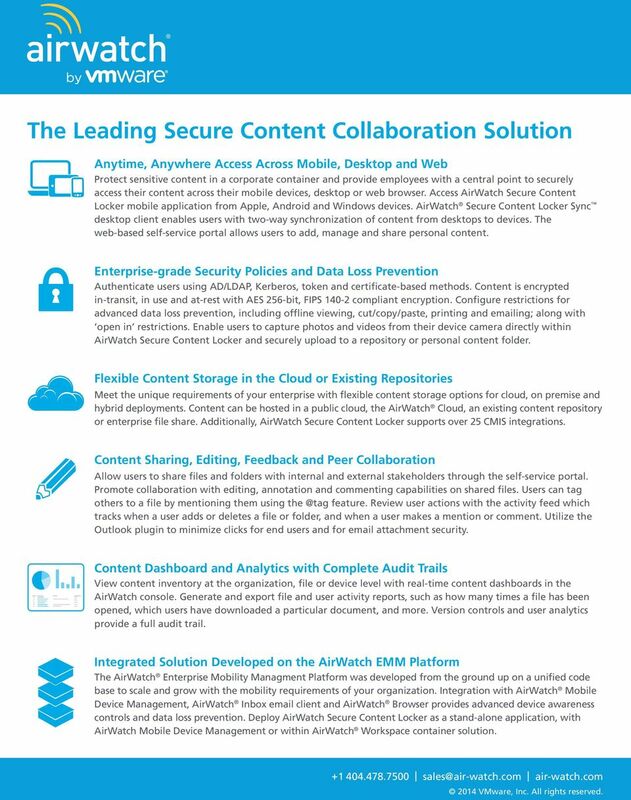 Additionally, AirWatch Secure Content Locker supports over 25 CMIS integrations. Content Sharing, Editing, Feedback and Peer Collaboration Allow users to share files and folders with internal and external stakeholders through the self-service portal. Promote collaboration with editing, annotation and commenting capabilities on shared files. Users can tag others to a file by mentioning them using feature. Review user actions with the activity feed which tracks when a user adds or deletes a file or folder, and when a user makes a mention or comment. Utilize the Outlook plugin to minimize clicks for end users and for attachment security. Content Dashboard and Analytics with Complete Audit Trails View content inventory at the organization, file or device level with real-time content dashboards in the AirWatch console. Generate and export file and user activity reports, such as how many times a file has been opened, which users have downloaded a particular document, and more. Version controls and user analytics provide a full audit trail. 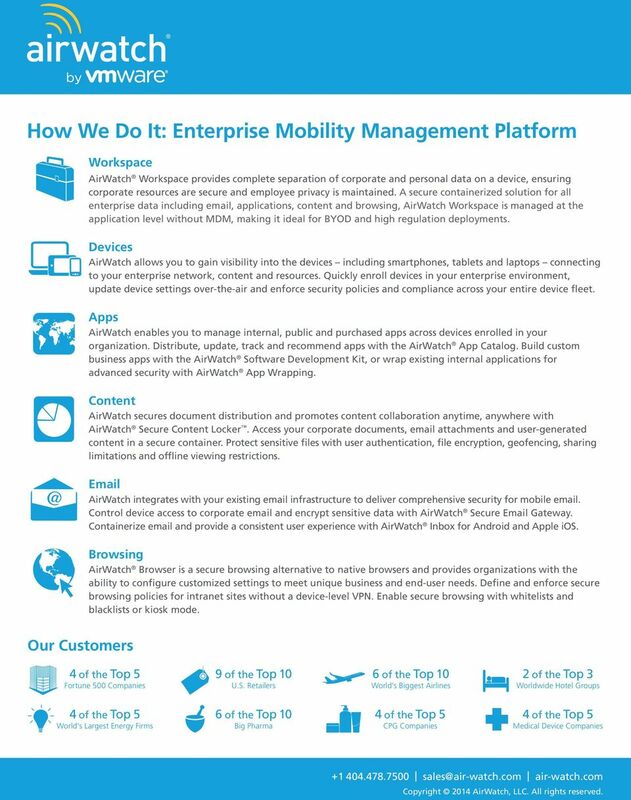 Integrated Solution Developed on the AirWatch EMM Platform The AirWatch Enterprise Mobility Managment Platform was developed from the ground up on a unified code base to scale and grow with the mobility requirements of your organization. Integration with AirWatch Mobile Device Management, AirWatch Inbox client and AirWatch Browser provides advanced device awareness controls and data loss prevention. Deploy AirWatch Secure Content Locker as a stand-alone application, with AirWatch Mobile Device Management or within AirWatch Workspace container solution. 6 Unified Laptop Management Configuration Management Configure corporate resources for laptops and ensure secure connectivity to back-end systems with certificate authentication and per-app VPN. Manage configurations based on dynamic smart groups and leverage custom profile configurations to deploy managed preferences. Automatically connect end users to corporate resources such as Wi-Fi and VPN, and configure Exchange Web Services and Outlook accounts automatically. Software Distribution Install, update and remove software packages as well as provide scripting and file management tools. Create an automated workflow for software, apps, files, scripts and commands and configure installation during enrollment, on-demand or at a pre-defined time. With AirWatch, you can also set the package to install based on conditions, including network status or defined schedules. Once deployed, view a log of successful installations and executions in the AirWatch console. Upload and deploy enterprise applications to laptops with defined app descriptions, images and categories for display in AirWatch App Catalog. Asset Tracking Monitor and track laptop inventory from a single console, and manage devices across organization groups with multitenancy and role-based controls for delegate management. View detailed laptop and end user information, and record and export reports or console event logs. Remote Assistance Provide support to your end users with remote assistance and troubleshooting. Send end users a push notification or lock the screen remotely. Perform a device query or remotely access file system logs to assist with troubleshooting. If a device is compromised, perform a remote device lock, enterprise wipe or full device wipe. Endpoint Protection Ensure laptops remain secure in your environment with a multiayer approach to endpoint protection. Require a device passcode and certificates for authentication, and configure restrictions to prevent user actions on the device. Ensure devices are protected against malicious attacks with automatic configuration of anti-virus and malware software. Full disk encryption ensures your corporate data is secure. 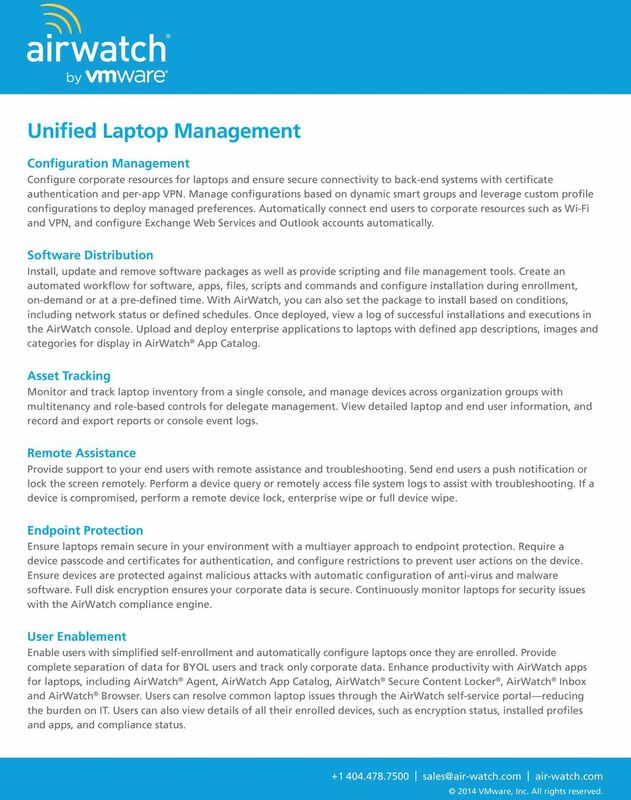 Continuously monitor laptops for security issues with the AirWatch compliance engine. User Enablement Enable users with simplified self-enrollment and automatically configure laptops once they are enrolled. Provide complete separation of data for BYOL users and track only corporate data. 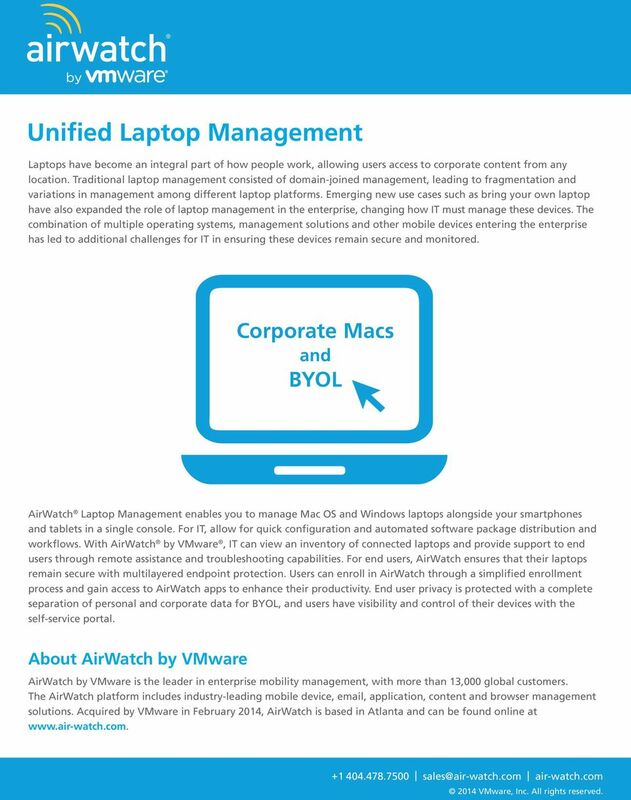 Enhance productivity with AirWatch apps for laptops, including AirWatch Agent, AirWatch App Catalog, AirWatch Secure Content Locker, AirWatch Inbox and AirWatch Browser. Users can resolve common laptop issues through the AirWatch self-service portal reducing the burden on IT. Users can also view details of all their enrolled devices, such as encryption status, installed profiles and apps, and compliance status.